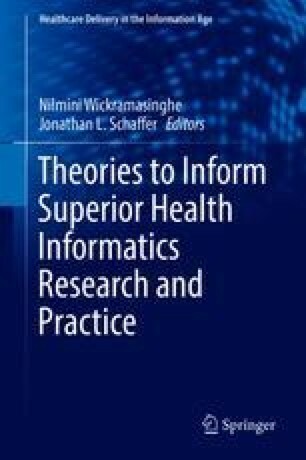 In today’s twenty-first century healthcare environment, the interaction of patients with information and communication technologies (ICTs) is a particularly interesting dynamic to researchers who study changes in related behavioral phenomena. One such phenomenon is self-monitoring. In the management of noncommunicable chronic disease, self-monitoring is considered a critical enabler for the attainment and maintaining of a better healthcare state. This paper examines the behavioral change of self-monitoring and the integral role of ICTs in enabling patients to self-monitor. Wickramasinghe, N., & Goldberg, S. (2007). The Wi-INET model for achieving M-Health success. In D. Taniar (Ed. ), Encyclopedia of Mobile Computing and Commerce (pp. 1004–1010). Hershey, PA: Information Science Reference. https://doi.org/10.4018/978-1-59904-002-8.ch168.